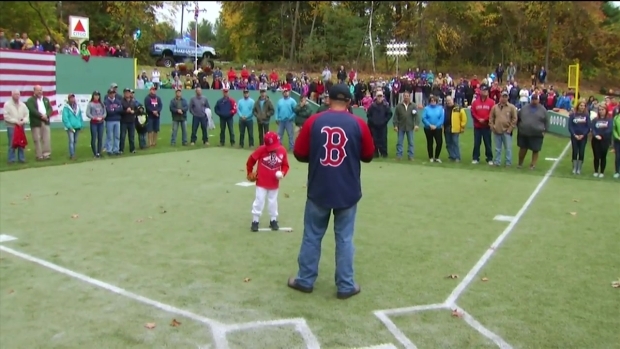 Hundreds of people came together to grant the wish of a 10-year-old baseball fan in Connecticut. When Make-a-Wish approached Thomas Hastings, who suffers from Duchenne Muscular Dystrophy, Thomas knew he wanted a ball park in his backyard. What he didn’t know was that hundreds of people in his Windsor community would come together to create a scale replica of Fenway Park in the Hastings family’s backyard. "At first when I wished for the baseball field I didn’t expect to get a mini-Fenway park. I just thought I was just gonna get a little flattened area and some bases and not Fenway grass, I didn’t expect that was going to happen," Thomas Hastings said. Thomas created artwork and wrote down aspects of Fenway Park he wanted included in the field, and the community did the rest. It took 34 days to transform Thomas’s hilly backyard into a mini-Fenway Park, complete with all the bells and whistles including a wheelchair-accessible Green Monster. On Saturday, dozens of people turned out for opening ceremonies at the park. Thomas’s parents say the community support has been overwhelming. "So many people donating their time, you know, more important than writing a check, showing Thomas that people really do care and people want to do something to make him have a great experience," Thomas’s mother Mary Hastings said. "It started off as Thomas’s wish for a baseball field in the town, in his backyard, and the town of Windsor came together, local contractors, everybody, and just made it so much more," said father Brad Hastings. Thomas visits Fenway often and has even thrown out the first pitch at a game. But now he has a place all his own to play baseball with friends and family anytime he wants. "Thomas faces many challenges," Brad Hastings said. "He’s had 14 surgeries. Dealing with the muscular dystrophy can be tough. Here it all disappears. Here’s Fenway Park in his backyard, where the magic is. Where he can forget about everything." On Saturday, they celebrated with the community over Wiffle ball and refreshments. Thomas threw the first pitch to Keith Herzig, chairman of the board for Make-a-Wish Connecticut. Make-A-Wish spokesman Michael Dominick said Thomas’s wish exceeded all expectations. "We dream big at Make-a-Wish, this is a bigger than even we had dreamed," Dominick said. Dominick said Thomas is an inspiration because he never lets his condition slow him down. "He doesn’t let it confine him or define him at all," Dominick said. Pam Keough, the president and CEO of Make-A-Wish Connecticut, described Saturday as one of the most exciting days she’s had as part of the organization. "We do a lot of things for the community and for folks out there but nothing like Thomas’s wish I’ve ever seen since I’ve been a part of this," Keough said. Thomas said he looks forward to having his friends over to play ball, including his teammates on the University of Hartford Hawks baseball team.